Je souhaite [dit Alice] que vous ne continuiez pas à apparaître et à disparaître si soudainement: vous donnez le vertige ! 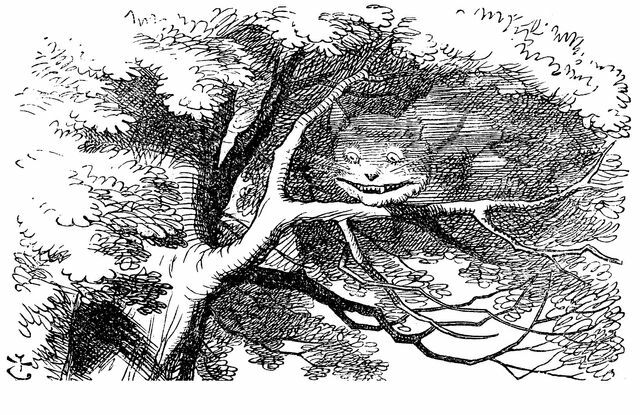 « D’accord, » dit le Chat [de Cheshire]; et cette fois il s’effaça assez lentement, en commençant par l’extrémité de la queue, et finissant par le sourire, qui demeura pendant un certain temps après que le reste du Chat ait disparu. Lewis Carroll. Alice au pays des merveilles. Costandi M. News. Scientists read dreams. Brain scans during sleep can decode visual content of dreams. Nature , 19 October 2012. Smith K. News feature. Brain imaging: fMRI 2:0. Nature 2012, 484:24-6. Antony J, Gobel E, O’Hare J,et coll. Cued memory reactivation during sleep influences skill learning. Nature Neuroscience 2012, 15:1114-6. Marzano C, Ferrara M, Mauro F, et coll . Recalling and forgetting dreams: theta and alpha oscillations during sleep predict subsequent dream recall. The Journal of Neuroscience 2011, 31:6674-83. Dresler M, Koch S, Wehrle R, et coll. Dreamed movement elicits activation in the sensorimotor cortex. Current Biology 2011, 21:1833-7. Reardon S. Dream movements translate to real life. Science. Science Now, 27 October 2011. Nir Y, Staba R, Andrillon T, et coll . Regional slow waves and spindles in human sleep. Neuron 2011, 70:153-69. Vyazovskiy VV, Olcese U, Hanlon EC, et coll . Local sleep in awake rats. Nature 2011, 472:443-7. Colwell CS. Neuroscience: Sleepy neurons? Nature 2011, 472:427-8. Nir Y, Tononi G. Dreaming and the brain: from phenomenology to neurophysiology. Trends in Cognitive Sciences 2010, 14:88-100. Wamsley E, Stickgold R. Dreaming and offline memory processing. Current Biology 2010, 20:R1010-13. Walker MP, Stickgold R. Overnight alchemy: sleep-dependent memory evolution. Nature Reviews Neuroscience 2010, 11:218. Diekelmann S, Born J. The memory function of sleep. Nature Reviews Neuroscience 2010, 11:114-26. Hobson JA. REM sleep and dreaming: towards a theory of protoconsciousness. Nature Reviews Neuroscience 2009, 10:803-13. Voss U, Holzmann R, Tuin I, et coll. Lucid dreaming: a state of consciousness with features of both waking and non-lucid dreaming. Sleep 2009, 32:1191-1200. Haynes J, Rees G. Decoding mental states from brain activity in humans. Nature Reviews Neuroscience 2006, 7:523-34. Dehaene S, Le Clec'H G, Cohen L, et coll . Inferring behavior from functional brain images. Nature Neuroscience 1998, 1:549-50. Kim K, Relkin N, Lee K, et coll . Distinct cortical areas associated with native and second languages. Nature 1997, 388:171-4. Kosslyn S, Thompson W, Kim I, et coll . Topographical representations of mental images in primary visual cortex. Nature 1995, 378:496-8. LaBerge, S, Nagel, L, Dement, W, et coll . Lucid dreaming verified by volitional communication during REM sleep. Perceptual and Motor Skills 1981, 52:727-32. LaBerge S, Owens J, Nagel L, et coll . "This is a dream": Induction of lucid dreams by verbal suggestion during REM sleep. Sleep Research 1981, 10:150.